Supreme Court, Obamacare Notre Dame contraception case: Lower ruling tossed. 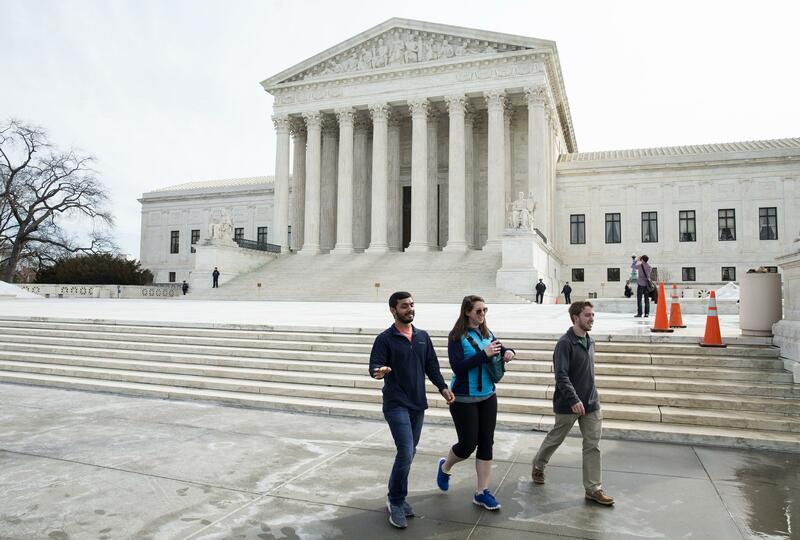 Tourists in front of the Supreme Court in a photo taken Monday. The Supreme Court has asked a lower court to reconsider a ruling against Notre Dame in light of the high court’s subsequent Hobby Lobby decision. Both cases relate to the Affordable Care Act’s mandate that employer-provided health insurance include contraception coverage for female employees. The Affordable Care Act requires that employer insurance plans cover contraception for women. Nonprofit religious organizations were exempted from this requirement in a 2013 ruling issued by the Obama administration. In cases of exemption, women covered by the insurance plan in question still have contraception covered—it’s just that the insurance company rather than the employer picks up the tab. In February 2014 an appeals court ruled against Notre Dame’s objection to the rule, refusing to grant an injunction that would allow the university not to follow the the law. The court also issued orders—orders, not full rulings—in 2014 in cases involving the Little Sisters of the Poor and Wheaton College (the Wheaton decision came less than a week after Hobby Lobby) that seemed to indicate sympathy towards Notre Dame’s position. Confusingly, though, the court also wrote in Hobby Lobby that it was not opposed to the nonprofit religious exemption system under which insurers are required to provide contraception coverage instead of objecting employers like Notre Dame. That contradiction was highlighted by the court’s female members in an aggressive dissent to the Wheaton action that accused the majority of disingenuity in Hobby Lobby.